Just when winter seems to be endless, it is the perfect time to escape to the warmth and beauty of the West Indies. Having operated voyages in the region for many years aboard Sea Cloud II we know the waters between Antigua and Barbados provide the perfect sailing conditions for her and we have therefore planned the itinerary to ensure ample sailing time allowing you to relax on deck in the warmth and enjoy the majesty of the vessel. During our island hopping adventure through the Caribbean Sea we will explore some of the most beautiful tropical isles, many still untouched by the hands of mass tourism. There is no doubt that the less commercialised of the islands have enormous charm and great natural beauty. But, beyond the fabulous beaches and pastel painted towns there is more. During the 17th and 18th centuries the West Indies attracted all manner of adventurers, buccaneers, pirates and the navies of the major European seafaring nations and this colourful history makes for an intriguing background to our voyage as we are able to hop from island to island and experience the heritage left by the Spanish, French, Dutch and British. Occasionally our paths will cross with the mega-factory like cruise ships and it is at such times we will appreciate even more how fortunate we are to be enjoying our classic ship that embodies all the best sailing traditions. To be on deck when the sails are fully extended as we navigate through the West Indies is a marvellous experience. The forces of nature and ingenuity of man combining in the most natural of ways allows us to experience the thrill of sailing and a form of transport that has existed since the earliest of times. The story of the Royal Navy is a vital part of the story of Britain. Our greatest heroes are sailors; our most memorable victories were won at sea. It is a long and distinguished story, going back to the Tudors and continuing right up to the present day. But one period stands out as a true ‘golden age’ - the years between 1750 and 1815. During those years, the great sailing battleships reached their peak of perfection in famous vessels such as HMS Victory. A uniquely gifted generation of seamen - of whom Horatio Nelson was but one shining example – sailed those great ships to an almost unbroken series of decisive victories. It is a record of success unparalleled in any other period, which no other navy in the world can match. One of the great theatres of war in this period was the West Indies. Some of the most important battles were fought there. Some of the key personalities served there and learned their trade sailing among the beautiful islands. This voyage offers a unique opportunity to learn about this pivotal period in British history, while exploring the places where that history was actually made – and under sail aboard the superb Sea Cloud II. Launched in 2001, Sea Cloud II is a stunning vessel, built along traditional lines, but offering deluxe accommodation. She combines the timeless elegance of sailing ships of the past with the highest safety standards and the luxurious comfort of modern cruise ships. The 32,000 square feet of sails are set by hand which is a truly magical sight; she really is the most exquisite of vessels. Day 1 - London to Antigua. Fly by scheduled flight. On arrival transfer to Sea Cloud II and embark. Moor overnight. Antigua was one of the main British Naval bases in the Windward Islands and so our voyage under sail would not be complete without a visit to this island with so much important history. During an island drive we will have the opportunity to visit the beautifully restored 18th century dockyard in English Harbour and see the impressive collection of restored historic buildings which were occupied by the British Navy from 1707 till 1899. Day 3 - St Barts. This tiny French West Indian island is proud of its reputation as a stylish and exclusive tropical resort. It is a very top-drawer place and the island’s capital of Gustavia, where the tenders will take us ashore this morning, offers gourmet restaurants, street cafés and smart shops which would not be out of place on the French Riviera. Day 4 - Jost Van Dyke. Today we sail through the beautiful island dotted waters of the British Virgin Islands. We will drop anchor at the little visited island of Jost Van Dyke and after a short Zodiac ride ashore enjoy relaxing on the beach or snorkelling. Day 5 - St Kitts. We will make a landing this afternoon on the delightful island of St Kitts. This lovely island has it all, restful green fields of sugar cane plantations, rainforests and long stretches of uncrowded beaches. The atmosphere here is wonderfully relaxed and full of old-world charm. Choose to either wander the streets of Basseterre with its colonial buildings or see the impressive UNESCO fortress at Brimstone Hill. This 18th century British garrison played a key role in the battles with the French and is situated on a hill offering fine views over to Nevis. We will remain moored here this evening. This morning we will land by tender on one of the loveliest and untouched islands on the Leewards. British naval history is linked with most of the Leeward Islands and on Nevis the connection is particularly interesting. It was here that Nelson met Fanny Nesbit and later married her in the old Montpelier House, on the site where a hotel now stands. Prince William, later to become William IV, who was under Nelson’s command, attended the wedding and gave the bride away. Our tour of the island will include Nelson’s Museum and the church displaying Nelson’s wedding certificate. Ask any Caribbean connoisseur about their favourite places and Montserrat will always be high on the list. Following the damaging volcanic eruptions of 1995 and 2010, much of the island has now returned to normal. We will visit the volcano observatory and learn how the islanders coped with the devastation it caused. We will see some of the untouched areas of the island which are as beautiful as ever. Known as the “Papillon” due to the butterfly shape of the two main islands, Guadeloupe offers a taste of France within the Caribbean. This morning we anchor off the northwest coast at the town of Deshaies which is the fictional setting of Honoré from the television series “Death in Paradise”. After breakfast we will drive to the nearby Botanical Gardens, an exceptional 12 acre park featuring tropical flora, palm trees, waterscapes and a parrot aviary. Return to the ship for lunch and enjoy a relaxing afternoon on board sailing to our next port of call. Day 9 - Iles des Saintes. The eight island Iles des Saintes archipelago dots the waters off the southwest coast of Guadeloupe. In 1782, this was the site of one of the greatest naval battles of the sailing era, in which the tactics used by the British admiral Sir George Rodney foreshadowed those used 20 years later by Nelson at Trafalgar. This morning tender ashore and explore at leisure or join Peter Warwick for a walk up to Fort Napoleon and visit the museum which focuses on the Battle of the Saintes. Stepping back in time, the island of Dominica is still the primitive garden that Columbus first sighted in 1493. An area of tropical rainforests, flowers of incredible beauty and animals that exist nowhere else in the world. We arrive this morning in the small port of Cabrits, just below the national park and the former British garrison of Fort Shirley, which successfully repelled a French attack during the Trafalgar campaign in 1805. The active can climb to the fort to explore the ruins, visit the small museum and maybe wander the surrounding trails on the lookout for birds, hermit crabs and lizards. Following our excursion, we will enjoy a further afternoon at sail. Day 11 - St Lucia. St Lucia is a splendidly rugged island of towering Mountains, lush green valleys and acres of banana plantations. Because of its strategic position, it was fought over repeatedly by the French and British and changed hands fourteen times. We will anchor off the island in sight of its bestknown feature, the twin peaks of the Pitons, which rise dramatically from the sea to more than 2400 feet. Tender ashore and explore the island independently or on a guided tour including the volcano. This delightful Grenadine island is totally unspoilt, a place of pure escapism with a charming old-world atmosphere. Today we will tender ashore and visit the Hegg Turtle Sanctuary followed by time to relax on one of the stunning beaches or for some swimming or snorkelling. This morning we will moor off the largest of the Grenada Islands, Carriacou. Home to no more than a few thousand people, yet almost 100 shops selling rum, this will be a perfect spot for us to spend time relaxing, whether it be walking along the stunning beaches or enjoying a swim in the clear blue waters. Re-join the vessel this afternoon and sail to Tobago. Today we will commence our excursion by boarding a glass bottom boat to sail to Little Tobago. From here we will walk a short way to view the abundant bird life where we will be able to observe red-billed tropicbirds in their natural habitat. We will then depart for Angel Reef where we can either continue to view the marine life from our boat or snorkel a short while. Day 15 - Barbados to London. Barbados is the most easterly of the Caribbean Islands, with Atlantic surf on the east coast and sparkling Caribbean waters on the west coast. Captain Powell landed here in 1625 and claimed the island for England, now independent it continues to embrace its British Empire roots, afternoon tea remains a tradition and cricket is the national sport. This morning an island drive will include visits to the historic 17th century Sunbury Plantation House and the impressive St John’s Church before making our way to the airport for our return scheduled flight to London. Day 1 - London to Barbados. Barbados is the most easterly of the Caribbean Islands, with Atlantic surf on the east coast and sparkling Caribbean waters on the west coast. Captain Powell landed here in 1625 and claimed the island for England, now independent it continues to embrace its British Empire roots, afternoon tea remains a tradition and cricket is the national sport. This morning an island drive will include visits to the historic 17th century Sunbury Plantation House and the impressive St John’s Church. Return to the vessel for lunch and enjoy our first afternoon at sail. Today we will board a glass bottom boat to sail to Little Tobago. From here we will walk a short way to view the abundant bird life where we will be able to observe Red-billed Tropicbirds in their natural habitat. We will then depart for Angel Reef where we can either continue to view the marine life from our boat or to snorkel a short while. Today we will moor off the largest of the Grenada Islands, Carriacou. Home to no more than a few thousand people, yet almost 100 shops selling rum, this will be a perfect spot for us to spend time relaxing, whether it be walking along the stunning beaches or going for a swim in its clear blue waters. Re-join the vessel and sail to our next port of call, Bequia. This delightful Grenadine island is totally unspoilt, a place of pure escapism in a charming old-world atmosphere. This afternoon we will tender ashore and visit the Hegg Turtle Sanctuary followed by time to relax on one of the stunning beaches or for some swimming or snorkelling. Day 6 - St Lucia. St Lucia is a splendidly rugged island of towering mountains, lush green valleys and acres of banana plantations. Due to its strategic position, it was fought over repeatedly by the French and British and changed hands fourteen times. We will anchor off the island in sight of its best-known feature, the twin peaks of the Pitons, which rise dramatically from the sea to more than 2400 feet. Tender ashore and explore the island independently or join the guided tour which will include the volcano. Stepping back in time, the island of Dominica is still the primitive garden that Columbus first sighted in 1493. An area of tropical rainforests, flowers of incredible beauty and animals that exist nowhere else in the world. We arrive this morning in the small port of Cabrits, just below the national park and the former British garrison of Fort Shirley, which successfully repelled a French attack during the Trafalgar campaign in 1805. The active can climb to the fort to explore the ruins, visit the small museum and maybe wander the surrounding trails on the lookout for birds, hermit crabs and lizards. Day 8 - Iles des Saintes. Known as the “Papillon” due to the butterfly shape of the two main islands, Guadeloupe offers a taste of France within the Caribbean. This morning we anchor off the northwest coast at the town of Deshaies which is the fictional setting of Honoré from the television series “Death in Paradise”. After breakfast we will drive to the nearby Botanical Gardens, an exceptional 12-acre park featuring tropical flora, palm trees, waterscapes and parrot aviary. Return to the ship for lunch and enjoy a relaxing afternoon at sea. Ask any Caribbean connoisseur about their favourite places and Montserrat will always be high on the list. Following the damaging volcanic eruptions of 1995 and 2010, much of the island is now returning to normal. We will visit the volcano observatory and learn how the islanders coped with the devastation it caused. We will see some of the untouched areas which are as beautiful as ever. This morning we land by tender on one of the loveliest and untouched islands on the Leewards. British naval history is linked with most of the Leeward Islands and on Nevis the connection is particularly interesting. It was here that Nelson met Fanny Nesbit and later married her in the old Montpelier House, on the site where a hotel now stands. Prince William, later to become William IV, who was under Nelson’s command, attended the wedding and gave the bride away. Our tour of the island will include Nelson’s Museum and the church displaying Nelson’s wedding certificate. Day 12 - St Kitts. We will make a landing this morning on the delightful island of St Kitts. This lovely island has it all, restful green fields of sugar cane plantations, rainforests and long stretches of uncrowded beaches. The atmosphere here is wonderfully relaxed and full of old-world charm. Either wander the streets of Basseterre with its colonial buildings or see the impressive UNESCO fortress at Brimstone Hill. This 18th century British garrison played a key role in the battles with the French and is situated on a hill offering fine views over to Nevis. Enjoy lunch on board and a relaxing afternoon at sea. Day 13 - Jost Van Dyke. Sail through the beautiful island dotted waters of the British Virgin Islands. Drop anchor at the little visited island of Jost Van Dyke and after a short Zodiac ride ashore enjoy relaxing on the beach or snorkelling. Day 14 - St Barts. This tiny French West Indian island is proud of its reputation as a stylish and exclusive tropical resort. It is a very top-drawer place and the island’s capital of Gustavia, where the tenders will take us ashore this afternoon, offers gourmet restaurants, street cafés and smart shops which would not be out of place on the French Riviera. Day 15 - Antigua to London. We will disembark this morning and during an island drive will have the opportunity to visit the beautifully restored 18th century dock yard in English Harbour. See the impressive collection of restored historic buildings which were occupied by the British Navy from 1707 till 1899. After lunch we transfer to the airport for our scheduled flight to London. PRICE INCLUDES: Economy class scheduled air travel • 14 nights aboard Sea Cloud II on a full board basis • House wine, beer & soft drinks with lunch and dinner • Noble Caledonia Tour Manager • Guest Speaker • Shore excursions • Gratuities • Transfers • Port taxes. fair weather. Tenders or Zodiacs will be used frequently during this voyage. Built to accommodate 94 passengers in five star luxury, Sea Cloud II offers a range of beautifully appointed suites and cabins which are furnished with great style. Spread over three decks are 29 deluxe cabins with showers, 16 junior suites with bathtubs, and two owner suites with bathtubs and showers. All accommodations have outside views and the bathrooms, in light marble, are unusually spacious and aesthetically pleasing. The two owner suites feature a king size canopy bed and all other cabins feature queen size beds with separate mattresses excluding category F staterooms which feature upper and lower single bed. The finest, carefully chosen fabrics, combined with leather, rattan and other materials, brass and gold, precious woods and marble together create an impressive ensemble. All cabins have a television with DVD player, minibar, dressing table, wardrobe and a safe. A welcome bottle of champagne and a fruit basket which is replenished daily are provided to enjoy whilst in your cabin. Cabins range in size from 14m2 to 27m2 (Cat A cabins measure 27m2; Cat 2 cabins measure from 22m2 to 23m2; Cat C cabins measure 20m2; Cat D cabins measure 21m2; Cat E cabins measure between 19m2 and 20m2 and Cat F cabins measure 14m2). No expense has been spared to create a sympathetic ambience in both the accommodation and public areas and this is reflected throughout the vessel. Public areas include an elegant lounge, library, fitness centre, boutique, lido bar and hospital. The single sitting dining room is airy and modern and the quality of the cuisine and service will be to the highest of standards, as one would expect on a Sea Cloud II cruise. The Lounge is located mid-ship on the Lido Deck offering comfortable seating areas. The vessel’s magnificent Steinway can be found here and will be played for your enjoyment by an accomplished pianist. In addition enjoy interesting lectures and presentations, or perhaps a drink from the bar. There is also a library onboard where youjoy the peaceful atmosphere. Relax on the Lido deck and experience the natural grandeur of travelling under sail whilst can relax, write postcards, play a board game, find a film to watch in your cabin, send emails from the laptop or just enwatching the sailors manoeuver the sails high above, rekindling memories of a bygone age. The cuisine aboard Sea Cloud II is of an exceptionally high standard, and has been accepted by the international Chaîne des Rôtisseurs. Enjoy international dishes complemented by local specialities selected fresh from the market by the onboard chef. Breakfast is buffet style and will include a sumptuous array of hot and cold items with the option to order freshly cooked eggs at the egg station. Lunches are both buffet style and served and subject to fair weather, some will be on the ship’s lido deck and may offer extensive barbecue options, locally caught fish and freshly picked tropical fruits. Dinner is served a la carte and is a four course affair with a vegetarian option always available. All cruises aboard the Sea Cloud II are full board with carefully selected wines and beers served to complement your lunch and dinner. All soft drinks, coffee and tea whilst onboard are also included. Whilst there are many large sailing ships offering passages around the world there are few if any that can compare in terms of luxury to Sea Cloud II. Despite the luxurious setting, casual clothing is appropriate and the atmosphere onboard is friendly and generally informal. Service is personal, and the crew of 65 quickly acquaint themselves with passengers and the officers on the bridge are also available to answer questions; manoeuvres permitting. After all, Sea Cloud II is not only a cruise ship, but a private yacht as well. Sea Cloud II combines the timeless elegance of sailing ships of the past with the highest safety standards and the luxurious comfort of modern cruise ships. The hospital is located on the Cabin Deck and is staffed by a ship’s doctor. In consideration of all passengers, smoking is not permitted onboard with the exception of designated areas on open decks. 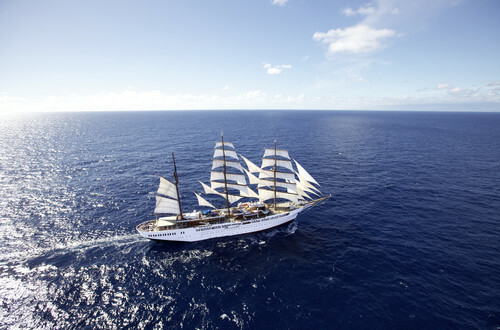 For our voyages under sail we have chartered the magnificent Sea Cloud II. Launched in 2001, she is a stunning vessel, built along traditional lines, but offering deluxe accommodation. She combines the timeless elegance of sailing ships of the past with the highest safety standards and the luxurious comfort of modern cruise ships. The 32,000 square feet of sails are set by hand which is a truly magical sight; she really is the most exquisite of vessels. Whilst there are many large sailing ships offering passages around the world there are few, if any, that can compare in terms of luxury to Sea Cloud II. Standing on the dock and looking up at the ship you cannot help but be amazed by the sheer majesty of the vessel. Despite the luxurious setting, casual clothing is appropriate and the atmosphere on board is friendly and generally informal. Service is personal, and the crew of 65 quickly acquaint themselves with passengers and the officers on the bridge are also available to answer questions; manoeuvres permitting. After all, the Sea Cloud II is not only a cruise ship, but a private yacht as well. A limited number of adaptors for hairdryers, mobile phones etc. can be obtained from the Reception Desk, located on Promenade Deck mid-ship. These should be returned to Reception at the end of the cruise. The entire ship is air-conditioned. All cabins feature individual temperature controls. In order to keep the air conditioning system working efficiently, please keep doors closed when in use. The ship uses a public address system to advise guests of all important information and activities during the cruise. Announcements in English can be heard throughout the public areas of the ship and in all cabins. Some beauty treatments and massages are available on board and appointments can be made at the Reception Desk. Fees for all treatments are available at Reception and will be charged to your onboard account. The Promenade Deck holds 16 junior suites and two deluxe outer cabins which all feature panoramic windows. There are two luxury owner's suites on the Lido Deck which also feature panoramic windows. Exuding a more maritime appeal, the 27 deluxe outer cabins on the Cabin Deck have traditional portholes. Three of these cabins are fitted with an upper and lower bunk - as was customary on traditional windjammers. And, of course, all the cabins have small sitting areas, a bright ambience and plenty of space for all your personal belongings. No matter which cabin you choose, the cabin service will provide everything you need. Your pretty maritime home is tidied twice a day, the fruit bowl is refilled, and the daily programme is left out for you to read. All beds in the cabins are movable with the exception of cabins: 401 & 402, 301 & 302 and 218–223 (Category F cabins have one upper and one lower single bed). The standard bed configuration shows all beds made up side by side with individual mattresses and box springs, which have the ability to be separated into twin beds. Your cabin is equipped with a TV with integrated video or DVD player, a direct-dial telephone, a radio and an electronic safe. In addition, each cabin has a selection of non-alcoholic drinks which are available free of charge. There is selection of quality toiletries in the bathroom. You will also find a bathrobe, slippers and a powerful hairdryer in your cabin. All of the cabins have a shower only whereas the junior suites have a bath only and the luxury owner’s suites benefit from a bath and shower. If you wish to contact the ship please call + 49 172 4367680. This is a German number so calls to this number are charged at an international rate. There is a phone in your cabin, which has access to an outside line. Outgoing call costs will be advised on board. You can make cabin-to-cabin calls free of charge (see section on Telephone Calls). You can contact the ship by email at seacloud2@seacloud.com - please indicate passenger name and cabin number as the subject. A laptop is available for use on board in the library. You can use this laptop or your own laptop to connect to the internet (Wi-Fi) using the access code, however please note that there is a charge for this. The code can be obtained from reception or the purser. If you have any dietary requirements such as vegetarian, low salt, gluten free and low cholesterol, please notify the Reservations Department. We regret that not all dietary requests can be guaranteed. If you have any specific or special foods that you require we recommend that you take some with you although we will endeavour to accommodate your needs. Once on board, please speak to the Chef or the Maitre D’ at dinner on your first night on board to reconfirm your needs. Breakfast, lunch, afternoon tea and dinner are served in the Restaurant. In the restaurant you will find tables for couples and groups of four, six and eight. The Lido Deck is often an inviting place to have lunch or an evening barbecue out in the open air. No matter whether you are sitting inside or outside, you can all enjoy this feast for the senses together in the same sitting and since you are dining on a tall ship with the character of a private yacht, you are free to choose your place and company at the table. Onboard culinary creations are sure to impress even the most discerning of connoisseurs and it is easy to see why Sea Cloud II was chosen to join the exclusive Chaîne des Rôtisseurs group. There is no lift and the ship does not have facilities for disabled or wheelchair dependent passengers. Additionally, most shore excursions involve some walking and some excursions are walking tours only. There is no chair lift on board. Your Cruise Director will provide you with detailed disembarkation information prior to the end of your cruise. This will include transfer information (where applicable). If you should have any specific queries, please do not hesitate to contact the Cruise Director as soon as possible after embarkation. You may dress however you feel comfortable, whether it be casual, summery or smart, it is up to you. Only at the traditional Captain’s Dinner do we recommend more formal attire. Non-slip footwear is essential. The voltage on board is 220 volts. Sockets are 2-round pin, European style. All bathrooms are equipped with a shaver socket. There are a limited number of adaptors available on board, which can be provided upon request. In the unlikely event that an emergency should occur during your cruise, we ask that you remain calm and follow the instructions of the crew. Life Jackets are located in your cabin. During the safety drill you will be instructed on how to wear your life jacket. We request that as soon as you enter your cabin, you carefully read the safety instructions fixed on the inside of your suite door. Guests should wait in public areas or in their suite until an announcement is made with instructions to disembark. Sailing times for each port are listed in the Daily Programme. Please note sailing times and ensure that you return back to the vessel at least 30 minutes prior to departure. A valid photo ID and your white Ship ID Card must always be carried ashore. In some ports a passport or port landing card must be carried when going ashore. This will be announced if required. If the ship is in a remote area and you hear a continuous blast of the ship’s horn then please return immediately to the landing site. When leaving the ship at any time while in port always ensure you have checked IN/OUT at the gangway. Gratuities have been included in your holiday price. In order to maintain health standards you will find hand sanitisers at the entrance to the restaurant. We kindly ask you to use these regularly. Laundry service is available onboard. Laundry bags and a price list can be found in the wardrobe in your cabin. Please fill in the laundry list and leave it together with the bag of dirty laundry on your bed. There are no public launderette or ironing facilities on board. In the interest of safety we ask that you do not use an electric iron in your suite. An ironing service is available at reasonable cost. Dry cleaning facilities are not available on board. Before you disembark the ship, please check your cabin to ensure you do not leave anything behind. If you discover you have left any items behind, please contact Noble Caledonia. If we are able to recover your item(s) we will contact you to arrange delivery or collection, and any costs incurred will be at your own expense. Although reception staff are happy to post letters on your behalf, they may not be able to do so straightaway or at the port of call at which you make such a request. Some postal services are unreliable and many letters or postcards that you ask to be delivered on your behalf may be delayed or even lost en-route. The hospital is located on the Cabin Deck and is staffed by the ship’s doctor. Daily surgery times can be found in the daily programme. The doctor can be reached at all times in case of emergency. Medicines and seasickness pills are available in limited quantities. As there are no lifts, only staircases, please ensure that you are fit and healthy for the cruise. However, if you do feel unsteady, please let us know. Special care requirements must be arranged in advance with the shipping company. To arrange an appointment with the ship’s doctor please contact the Reception. Seasickness tablets are available from Reception, and should be taken at least one hour prior to departure. MINI BAR For your convenience a Mini Bar facility has been set up in your cabin with soft drinks free of charge (replenished daily). News channels are available on your cabin TV and in addition daily news bulletins can be found at the Library. Library: Choose from our selection of German and English-language books, videos and board games. Please ensure that you return them once you have finished with them. The Lounge: Daily Briefings by the Cruise Director are given in the Lounge. The Lounge is located on the Lido Deck and is always open. Self-service coffee, tea, soft drinks and water are available all day. Informative Talks from the Guest Speaker are also given here. Fitness and Sport: Fitness enthusiasts can use the 100-metre long lido deck as their running/walking circuit while taking in all the different views which you can expect on board a tall ship. For others, the morning exercise sessions are just the way to start a new day. In the smart fitness studio, you will find dumbbells, bikes, treadmills and step machines for more focused workouts, and the adjoining sauna area will enhance your general well-being. Your comments are important to us therefore before your cruise ends, you will receive a questionnaire. We are always looking for ways to improve your holiday and in order to do this we need some feedback from our guests. Kindly hand your completed questionnaire in at Reception. In the closet of your cabin is an electronic safe which can be programmed with a personal code. Should you require any assistance, please contact reception. International Maritime Law requires a lifeboat safety drill to take place. This will take place prior to sailing. All guests must attend this compulsory and important exercise. Please listen for the announcements. During the drill, all ships services will be suspended. Your assigned lifeboat station, location of your life jacket and the signal for lifeboat and fire drills are clearly explained on the emergency card posted on the back of your suite’s door. Life jackets are located in your cabin. During the safety drill you will be shown how to wear the lifejacket. It is essential that you take certain safety precautions while on board. Walk, never run and be especially careful on wet and slippery decks. Ladies are advised to wear low heeled shoes especially on deck. Footwear should be worn at all times. Hold on to the handrails in passageways and stairways. These personal ID cards with essential information are issued to each guest during embarkation. Please ensure you check in and out at gangway so that we can ensure you are on board prior to sailing. Sea Cloud II offers a smoke-free cruise environment. Smoking is not permitted inside the ship. Smoking is permitted only on the outer decks outside of meal times. We kindly request that smokers take the comfort of other passengers into consideration. Smoking is prohibited on the Blue Lagoon deck and covered areas of the Spanker and Lido deck at all times. Calls to other cabins can be made free of charge by dialling the cabin number. You can make an external satellite telephone call from your cabin. Lift the handset and press 0. Enter the country code then city code without zero (0) at the beginning followed by the phone number and then pound key. Example for UK: 00 44 (0) phone number. Costs are available from Reception and charges are automatically billed to your on board account. All suites are equipped with a television with a built-in DVD player. DVD’s are available to borrow from the library. The bridge area can be visited during the day and/or at specified times subject to the captain’s approval. The bridge is closed during manoeuvring operations and night cruising. Water from the taps in your cabin is safe to drink. Some destinations may require the use of the ships Zodiacs or local tender boats to go ashore. Guests will be advised where and when to meet the Zodiac or local tender boat to go ashore. Please ensure that your hands are free at all times and accept the assistance given by the crew on board Sea Cloud II when boarding tenders / Zodiacs. A Zodiac safety briefing will be given. These details should be used as a guideline only. Information is subject to change. Rear Admiral Roy Clare ​has almost three decades’ experience as a professional museum director and as a non-executive in social businesses. His roles have included Director National Maritime Museum, Queen’s House & Royal Observatory, Greenwich (2000-2007), Chief Executive Museums, Libraries & Archives Council (2007-2011) and Director Auckland War Memorial Museum, New Zealand (2011-2017). Previously in the Royal Navy, Roy served worldwide from junior seaman to rear admiral. His commands included destroyers, the aircraft carrier Invincible and Britannia Royal Naval College, Dartmouth. He retired voluntarily to develop opportunities in museums. Roy currently chairs Chelmsford Cultural Development Trust and he is also a trustee of Good Things Foundation, Britain’s leading charity for digital inclusion. An active yachtsman, Roy has raced in the Fastnet and Sydney-Hobart races. Nowadays he sails purely for pleasure, mainly in British waters. Roy and his wife Sarah live in coastal Essex. They have three adult children and two granddaughters. In 2007 Roy was made CBE 'for services to museums'. In 2018 he was appointed a Deputy Lieutenant for Essex.